I've been gripped by the concept of Turkish Delight since I first encountered it as a child in C. S. Lewis' Lion, the Witch and the Wardrobe. 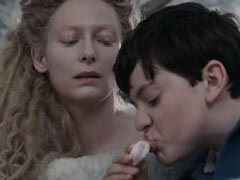 In the story, a little boy is offered enchanted Turkish Delight by the terrifying White Witch of Narnia. The treat acts as a combination truth serum/kid heroin. I had no reference for Turkish Delight in American culture, but as a devoted candy-snarfer (Trick-or-Treat bags and Easter baskets never lasted longer than a day or two around me), I completely understood the allure of a sweet so irresistible that it would compel you to rat out your nearest and dearest. It's only in recent years that I've finally clamped my gnashers around this wondrous confection, also known as loukhoum. The unholy texture is one of its make-or-break points: it is gelatinous (though not necessarily made of gelatin), squishy, and covered in powdered sugar. The yielding, jelly-like consistency is creepy and sensual at the same time, like biting into soft, soft skin. And here comes the kicker: classic Turkish Delight, with its blend of rose, honey, pistachio and vanilla, tastes like exotic perfume. For this candypants fumehead, rose loukhoum is the perfect storm. I'm eating perfume! And candy! With a biting-into-flesh mouthfeel! It's unsettling and perfect. I bought the Turkish Delight in the photos from The Turkish Deli in London's Borough Market. I was especially fascinated by one of their flavors, mastica, which is another ancient perfume ingredient. Mastica's pine-sappy, borderline incense flavor is a perfect match for the melty-jelly texture of the sweet. It's a heapin' mouthful of synesthesia. Ah, Turkish Delight! We bought some at an outdoor market in Munich for a small fortune, and it was divine. I, like you, love perfume-y notes in my food: rose, mastica, saffron, violet. I wonder if there's a Turkish enclave here in the States where this delicious confection can be had? There must be, right? It seems to be easier to find all the variations on nutty/drizzled honey/filo pastry baklava sweets than Turkish Delight in the U.S.
Ah, Katie, you perfectly capture the appeal of Turkish Delight! And now I have a hankering for some. There's a related delicacy that I've only seen in Instanbul (and I have no idea what it's called--had I known how hooked I would become, I surely would have tried harder to remember the name) that is made from what the vendor described as "dark apricots" (dried differently in the sun?). He claimed the only ingredients were apricot, rose, and a little dusting of coconut, but I swear there must have also been some mild form of crack involved. If you see something like this in London, I urge you to snap it up! Denise, I don't know where you live, but in the Boston area it's not too tricky to find Turkish delight; there's a little row of Turkish and Armenian shops in Watertown that carry a variety. Otherwise, Chowhound's boards have proven pretty reliable for tips on specific treats in an area near you! Maybe the "dark apricots" are unsulfered? Sulfered apricots keep their pretty color. If it's only those three ingredients, how is it Turkish Delight? Katie, have you found any that's violet flavored? Maybe so! A language barrier prevented a thorough understanding on my part, but that is an excellent hint in my search for this treat. Thank you, Nora! I suppose it is related in that it's also a Turkish treat, and it looks and tastes similar to Turkish Delight (which is in part why I suspected there were more ingredients involved). It felt a bit like a health-food version of Turkish Delight, but didn't sacrifice the fragrant chewiness that makes Turkish Delight so fun to eat. I'm now fully motivated to seek out the apricot/coconut treat - I saw another Turkish stand at Borough market with fruity/coconutty squares, so am thinking this might be the thing. Nora, I've not yet encountered Violet Turkish Delight yet, but the antennas are up! You can get Violet Turkish Delight from the ALGERIAN COFFEE STORE IN OLD COMPTON STREET, SOHO, LONDON. They also do a mail order service the US. You're right Nora, they aren't treated with sulphur. Instead they're dried under the sunlight and their name is "gün kurusu" here in Turkey, which literally means dried in the day. As for the desert Elizabeth refers to, I think it may be called simply "gün kurusu" apricot desert. My apologies for the typos, I meant "dessert". Thanks for the tip, Chris. And good to get the confirmation on the apricot treats, Anonymous. I see I've got a lot of snacking ahead of me. Luckily for me, I don't get my hands on it that often. I never thought about it like that, but yes, it does feel like you're eating a perfumed treat. by Keiko Mecheri, totally addictive and no calories! Loukhoum PdS is big time num-num. Which are the milky ones - vanilla? Those ones were sold out when I was there the other day. I think there might have been a coconut milk one? It was ages ago on a pilgrimage from Scotland. Am now at their website buying pine sap for my husband! Did you never try the ubiquitous Fry's Turkish Delight (which is covered in chocolate) when you lived here? A Welsh friend of mine was addicted to it and I can't say that I was that enamoured. That was my first introduction to this type of sweet. Lots of restaurants in London bring a plate of the non chocolate covered type to your table when the coffee is served. Eww, no, it looked weird - at least from the artist's rendition on the wrapper. My UK corner shop treat was always Caramac. I always mean to one day eat a caramac and smell une rose by Frederic Malle, just to check to see if my impression that this is a Rose with a Caramac accord is actually accurate or just a fancy. But I'm never likely to have both to hand, so if you ever do, please let report back to me! My husband loves Turkish delight, but only the brand whose name escapes me. He grew up eating it, and I once gave him 20 boxes of it for Christmas, because I thought it was funny. I don't think he likes it now. Nora, that's one way to kill with kindness! Hi Katie! I initially thought you found a real, edible perfume :)) I was wondering how that works. I am not a fan of turkish delight, I never liked it and probably never will, but I still buy it from time to time and then try to convince my friends and colleagues to eat it :D Two year ago I visited Turkey and it was impossible to leave the market without all kind of Turkish Delight and oder sweets. What I trully miss is the turkish Pistachios. They taste great. I think I am now in the mood for a cup of rose tea; or maybe jasmine. I have to decide fast. Mmmm...both those teas are divine. The lychee tea smells just like it tastes, which is unusual. To me, it is like the most fragrant roses ever. The first one, LiZhiHong. I'm addicted! The apricot coconut type of Turkish Delight is actually Not turkish delight. It is called Apricot Cezerye (Kayisi Cezerye) Cand contains Hazelnuts with a coating of coconut. We have that at Borough Market, London Bridge as well as Carrot Cezerye. Both classic Turkish sweets. Another new flavour for those Pistachio lovers is, Rose and Pistachio. Hi Turkish Deli! I did see that carrot sweet and wonder about it. I'll try the Kayisi Cezerye the next time I'm at your stand. I couldn't stop eating Turkish Delights when I was in Turkey last year. We got them as souvenirs at the Spice Bazaar and got some more at the airport in Istanbul before heading back to the States. What's your take on Serge Lutens' Rahat Loukoum? The Guide famously refers to it as "unabashedly trashy" (which sounds great to me! ); am wondering whether you've sniffed it and how you think it compares to its namesake sweet which you so eloquently describe. We had a round wooden box of Turkish Delight every Christmas - strictly lemon and rose flavours. You might have been able to sell "Mastica" to my dad on ecclesiastical grounds, but with a name like that it would have been a stretch. Did mastica flavour remind you of Voyage d'Hermes? I always get a mastic note from this and from Encre Noire. Turkish loukhoums are a little gelatinous and chewy for my tastes. I a more used to the Greek variety which is softer and melts in the mouth. What an interesting observation! I happen to have a bottle of Voyage d'Hermes parfum to hand, and I'm smelling it now and pondering on it. I smell a tangy citrus wood, not quite piney enough to full-on recreate my recent mastica run-in, but now that you mention it, there is a resemblance.